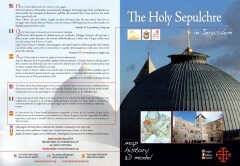 home / Ideas for gifts / Artistic products / Holy Sepulchre flyer: discover and experience the Basilica of .. This flyer is a simple, practical, comprehensive guide for those who wish to visit the Basilica of the Holy Sepulchre in Jerusalem. Within it’s four pages, the flyer summarises the historical reconstruction of the Basilica over various periods throughout history and contains two three-dimensional models that allow pilgrims and visitors to familiarize themselves with the Basilica’s complex internal structure. The flyer is available in Jerusalem by the Custody of the Holy Land’s office and is now available to be downloaded from our website. Click on the image to see it! The Holy Sepulchre Flyer is intended as an addition to the Holy Sepulchre Pilgrim’s Guide, which is more detailed and comprehensive but practical and easy for readers to follow. The flyer is available in three languages: English, Spanish and Italian.